1... 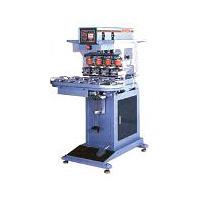 This serial equipment can be applied to the flat printing of all kinds of materials such as key pads, plate boards, LCD display board, keyboard, instrument, glass, ceramic paper and paper. 2... The web vertically goes up and down with electronic power. It only needs a little ink to print and when working it will not be spilt out, which ensures easy clean. 3... The printing mileage is driven by motor. It is fitted with German Bosch Rexroth ball way and has the continuous variable adjustment, which promises stable and smooth printing. In addition, we use Japan"NIAS"main control circuit, German "Bosch Rexroth" pneumatic components, American "PARKER"and Italian "PNEUMAX" spare parts. 4... The printing platform is equipped with vertical and horizontal adjusters and self-lock setting, which guarantees the printing accuracy. What's more, the printing platform has the high-power vacuum adsorption system. 5... The printing mileage and web size can be adjusted, which suits different printing size according to different specification. 6... It is equipped with the away-from-the-web setting whose height and speed can be adjusted, which guarantees the printing quality. 7... It is equipped with the safety protection device, which secures operation workers' safety. Screen Printing Machine^$This serial equipment can be applied to the flat printing of all kinds of materials such as key pads, plate boards, LCD display board, keyboard, instrument, glass, ceramic paper and paper.